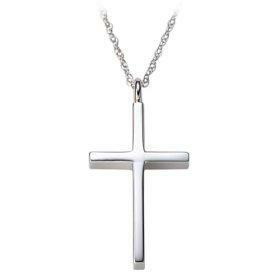 Sterling silver cross necklaces are one of the most versatile items of jewelry. They look marvelous when worn by men, women and children. The cool bright white of the silver metal looks fantastic when formed into any style of cross. The cross shape has appeared in necklaces and jewelry for many hundreds of years. The cross is one of the important symbols of the Christian faith, however the bold shape and the easy clear lines have meant that the cross shape lends itself to many jewelry designs and is a popular choice by many designers. Cross necklaces are no longer seen as purely a symbol of the Christian faith, although it is cherished and treasured by many Christians, and it is worn by people who hold other or no beliefs. One of the attractions of a silver cross necklace is the wide variety of styles that jewelry designers create. Plain: The plain cross is perhaps the most simple of designs, yet with strong symbolism. The bold design works equally well as a tiny charm hanging as a discrete pendant around the neck, to a large striking cross that is worn as a statement. Celtic: The Celtic cross remains popular with jewelry designers and features in many collections. The complex designs of the Celtic style look fantastic in silver. Over time, the silver develops a deep patina in the recesses that accentuates the intricate designs. The Celtic cross works equally well for men as it does for ladies and complements a whole range of other items of jewelry. Engraved: Many crosses are engraved either with a pattern or with a few words. This adds to the texture of the cross and the engraving brings an added dimension. Many vintage cross necklaces are engraved as this style was popular in the Victorian era. Gemstone Encrusted The gemstone encrusted cross necklace became exceedingly popular at the end of the twentieth century. Many famous celebrities were seen with large jeweled crosses around their necks. These necklaces made their way into the high street too, set with more common gemstones or gemstone simulants that add extra sparkle to a silver cross. Silver is a popular jewelry choice and is ideal for every day wear. Silver is slightly harder than other precious metals meaning that it is better able to take the knocks and bumps of day to day living. This is important with the shape of the cross as the arms of the cross are vulnerable to damage. Silver is less costly than other precious metals which means that many independent jewelry designers are able to offer a range of styles in silver. This gives a much greater choice of unusual or one of a kind cross designs. Silver cross pendants are typically combined with silver chains. There are many different styles and while the curb chain remains popular, other types such as the snake chain or box chain look extremely attractive. In addition to silver chains, leather thonging, rubber or silk necklets are also interesting options. These work exceedingly well with silver and can create extremely stylish sterling silver cross necklaces. Will the style of cross necklace go out of date? A high fashion cross necklace that looks great now, might look extremely dated in twenty years time. 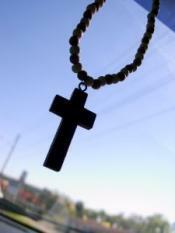 Is the cross necklace to be worn by a child or kept carefully until they are older? A cross that is suitable for a baby may look too small and insignificant on an adult. Silver jewelry that is stored should be wrapped carefully in acid free tissue paper to help stop tarnishing. Is the cross and chain hallmarked? As this will hopefully become a family heirloom it is important that the cross is silver and not a base metal that will deteriorate over the years. A hallmark will offer a reassurance as to the quality of the metal used. A presentation box will help keep the cross necklace in tip top condition for when the child is old enough to enjoy it. A silver cross necklace will give years of pleasure and provide many happy memories. The wide variety of styles available means there is bound to be a cross to meet every taste.